of pear shape with broad base and cup-shaped mouth, the sides tapering up to a short cylindrical neck, the galleried rim with concave sides and flat flaring lip, covered inside and out with a translucent glossy glaze of pale greenish tint pooling to bluish-green around the mouth, the crisply finished wide ring foot and flat recessed base left unglazed revealing the fine, hard white porcellanous body. 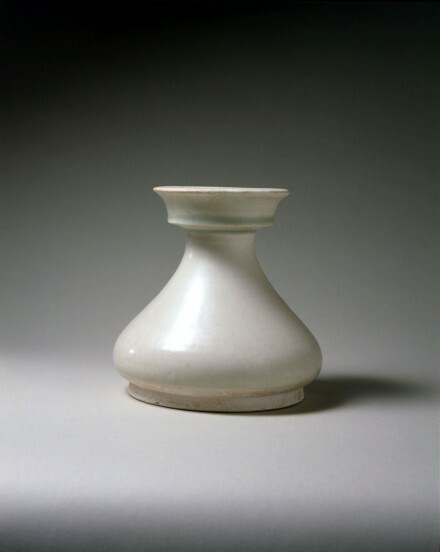 A glazed white pottery vase of this distinctive form complete with (broken) cover, excavated from a Sui tomb at Houchuan, Henan province and now in the Chinese History Museum, Beijing, is illustrated in Zhongguo Taoci Quanji: Sui Tang, Vol. 5 (The Complete Works of Chinese Ceramics: Sui and Tang Dynasties), Shanghai, 2000, pl. 13, p. 46, with caption on p. 219. Two other similar vases excavated from a Sui tomb at Ermencun in the western suburbs of Xi’an dated to A.D. 610, also now in the Chinese History Museum, are illustrated by Koyama, Chugoku Toji (Chinese Ceramics), Tokyo, 1970, fig. 21. Another vase of this form, excavated from the tomb of Li Jingxun, dated by epitaph to A.D. 608 and now in the Shaanxi Provincial Museum, is illustrated by Mayuyama in Chugoku bunbutsu kenbun, Tokyo, 1973, pl. 87; and a covered vase of this form, found in a set of glazed white pottery tomb furniture excavated from a Sui dynasty tomb at Anyang, Henan province, is illustrated in Kaogu, 1992, No. 1, pl. 4, no. 5. Compare also the vase illustrated by Gyllensvärd in Oriental Ceramics: The World’s Great Collections, Vol. 8, The Museum of Far Eastern Antiquities, Stockholm, Tokyo, 1982, fig. 41, from the Collection of King Gustaf VI Adolf, no. 1814. Other comparable examples are illustrated by Mino, Pre-Sung Dynasty Chinese Stonewares in the Royal Ontario Museum, Toronto, 1974, pl. 46, p. 61; by Toller, “The Origins of Chinese White Porcelain” in Transactions of the Oriental Ceramic Society, Vol. 39, London, 1971-73, pl. 15; and by Tseng and Dart in The Charles B. Hoyt Collection in the Museum of Fine Arts: Boston, Vol. I, Boston, 1964, no. 67. Vases of this form were also produced throughout the first half of the Tang dynasty and numerous examples with sancai and blue glazes are also recorded, but the Sui dynasty glazed white pottery vases of this type, produced at kilns in the Northern provinces of Hebei and Henan using the local clay with high kaolin content, are the most elegantly proportioned and finely potted of all.